Indian stock market is the oldest among all in Asia. Today BSE and NSE are the two most advanced and best stock exchanges of India. In this article we will take you through the history of BSE and NSE. The Bombay Stock Exchange (BSE) is known as the largest and oldest stock exchange of India. Established in 1875, BSE has facilitated the growth of the Indian corporate sector by providing it an efficient capital-raising platform. It traces its history to the 1850s, when four Gujarati and one Parsi stockbroker would gather under banyan trees in front of Mumbai’s Town Hall. Due to Increase in number of members the group finally moved to Dalal Street, Mumbai in 1874 and in 1875 became an official organization known as ‘The Native Share & Stock Brokers Association’. In 1956, BSE became the first stock exchange to be recognized by the Indian Government under the Securities Contracts Regulation Act. Bombay Stock Exchange developed BSE Sensex in 1986, giving BSE a means to measure it’s overall performance of the exchange. They switched to an electronic trading system in 1995. It took the exchange only fifty days to make this transition. In 2000, BSE used this index to open its derivatives market, trading Sensex futures contracts. The development of Sensex options along with equity derivatives followed in 2001 and 2002, expanded BSE’s trading platform. 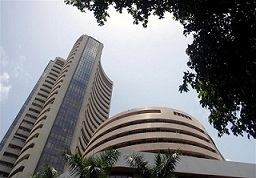 National Stock Exchange (NSE) is located at Mumbai, India. It is the 11th largest stock exchange in the world by market capitalization. NSE’s key index is the S&P CNX Nifty, known as NIFTY (NSE fifty), an index of fifty major stocks weighted by market capitalization. NSE is mutually owned by a set of leading financial institutions, banks, insurance companies and other financial intermediaries in India. But its ownership and management operate as a separate entity. There are at least 2 foreign investors “NYSE Euronext” and “Goldman Sachs” who have taken a stake in the NSE. It is the second fastest growing exchange in the world with a recorded growth of 16.6%. SEBI is the regulator for securities market in India. It was established by The Government of India in the year 1988 and has given statutory powers in the year 1992 by SEBI Act, 1992. Both NSE and BSE are monitored by SEBI.